It's full throttle ahead for three Clusters of Excellence initiatives with recruitment underway for nearly a dozen top-flight researchers to join the University of Oregon. With $1.7 million in initial funding, the UO is recruiting up to six leading scientists to help pursue alternative approaches to meet tomorrow's needs in energy and sustainable materials and to expand genomics research. In addition, the fully funded obesity prevention cluster program is actively courting a handful of top researchers. Hiring for the Faculty Cluster in Chemistry and Physics to Amplify Excellence in Energy and Sustainable Materials, led by Jim Hutchison, and the Center for Genome Function, directed by Eric Selker, is moving forward with recurring funds from licensing revenues and the UO's strategic investment process, said interim President Scott Coltrane. Both clusters are among 10 initiatives identified in 2014 as priorities for faculty expansion. "We will continue to look for philanthropic and other external funds to enhance these clusters," Coltrane said in a note to campus. "This is a time of new beginnings for the University of Oregon, and the Clusters of Excellence Faculty Hiring Initiative is a key component of our next chapter." The energy and sustainable materials cluster will build on the UO's existing strengths in green chemistry, materials science and sustainable materials by promoting an applied science emphasis, said Hutchison, the UO's Lokey-Harrington Chair in the Department of Chemistry. The cluster is an initiative of the Materials Science Institute and the Departments of Chemistry and Physics. Faculty hiring, Hutchison said, will strengthen the vision established by UO leadership 20 years ago to become a leader in sustainable materials. 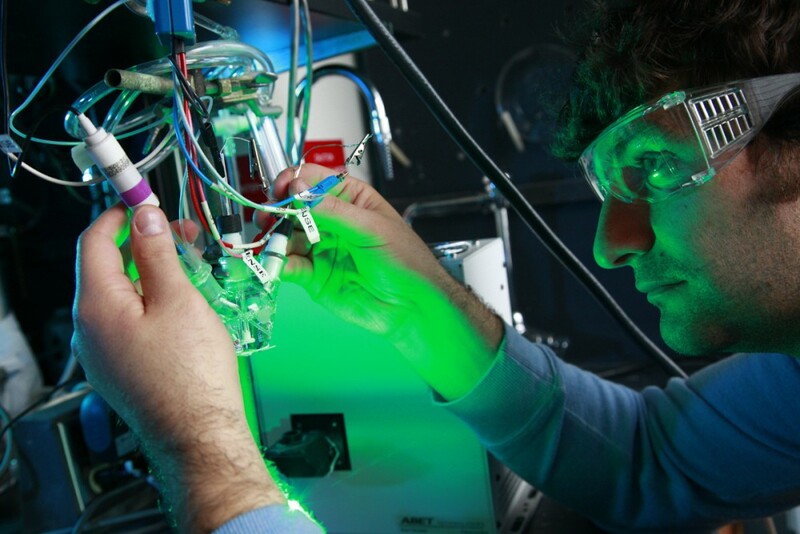 The UO, he noted, is part of the National Science Foundation-funded Center for Sustainable Materials Chemistry, is home to the Center for Advanced Materials Characterization in Oregon and has a graduate internship program that provides a foundation for industry-academic collaborations. "These cluster hires will bridge existing strengths to design new materials through the power of computation and big data, discover new methods to produce high-performance materials that are also sustainable and integrate these new materials in devices such as those that can produce electricity and fuels using the sun’s energy," he said. "This investment will provide a foundation for interdisciplinary, applied science efforts at the UO." The Center for Genome Function, an initiative of the UO's Department of Biology and Institute of Molecular Biology, will focus on integrated genetic and epigenetic studies. "Interest in this research area has never been higher," said Selker, who in 2012 was elected into the National Academy of Sciences. "The field has exploded because of important discoveries and major advances that have created exciting new areas of research such as RNA biology, chromatin structure and function, and epigenetics." Epigenetics refers to heritable chemical modifications to gene expression that are not attributable to alterations in the sequence of DNA. Among other things, researchers in the Center for Genome Function will study how parts of genomes are appropriately turned on and off. "Understanding epigenetic changes will greatly advance our knowledge of how abnormalities in genome function lead to human diseases — including cancer, neurodegenerative diseases, mental disabilities, birth defects and infertility," said Diana Libuda, an assistant professor of biology who opened a DNA-research lab in the Institute of Molecular Biology in January. New faculty in the cluster will allow the UO to build on the reputation and strengths of the Institute of Molecular Biology, which was founded in 1959, and will increase collaboration of geneticists, biochemists and cell biologists. Coltrane also announced that recruiting is continuing for the Cluster of Excellence in Health Promotion and Obesity Prevention, which received $20 million last November in philanthropic support. The College of Education, which is primary home to the cluster, has posted a job announcement and invited several researchers to visit campus, said Beth Stormshak, associate vice president for research and director of the UO's Prevention Science Institute. "We are actively recruiting and hope to fill four of five positions by fall 2016," she said. Recruiting efforts for the clusters, Coltrane said, has the full support of incoming President Michael Schill. Efforts will continue to seek resources to fund the other seven selected clusters and Coltrane will lead planning for future calls for additional cluster proposals upon return to the provost position.